This product is no longer available and has been replaced by: CPEC310. Some accessories, replacement parts, or services may still be available. 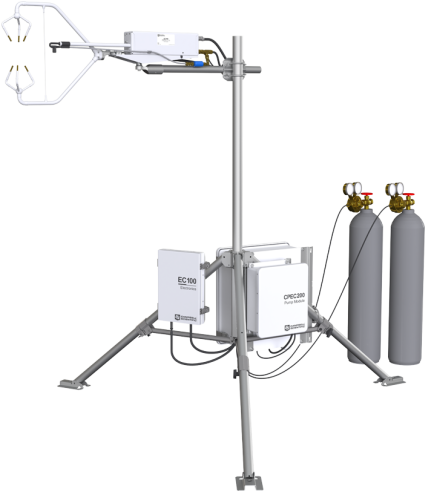 The CPEC200 is a turn-key, closed-path eddy-covariance (EC) flux system for long-term monitoring of atmosphere-biosphere exchanges of carbon dioxide, water vapour, heat, and momentum. A complete system consists of a closed-path gas analyzer (EC155 closed-path gas analyzer with updated vortex intake design), sonic anemometer (CSAT3A sonic anemometer), datalogger (CR3000 datalogger), and sample pump. A valve module is also available for automated zero and span. The gas analyzer’s intake design and small sample cell volume (5.9 mL) provide excellent frequency response (4.3 Hz cutoff frequency) with low total system power (12 W). Additionally, the vortex intake greatly reduces maintenance and maintains frequency response compared to traditional inline filters. The gas analyzer’s small sample cell volume minimizes the sample residence time (50 ms at the system’s nominal flow rate, 7 LPM). This gives excellent frequency response (5.8 Hz half-power bandwidth) with low total system power (12 W). A fibreglass enclosure houses the datalogger, optional data storage peripheral, optional valve module, and the electronics that interface with the CPEC200 pump module. The CPEC200 system enclosure can be mounted to a tripod mast, CM106 tripod leg base, tower legs, or a large diameter pole. The pump module, a standard component of the CPEC200 system, consists of a small dual-head diaphragm pump with a brushless DC motor mounted inside a fibreglass enclosure. An integral cable connects the pump module to the CPEC200 system enclosure, which provides power, temperature measurement and control, pressure measurement, and pumping speed measurement and control. Campbell Scientific offers two valve module versions. The basic three-valve module (pn #27559) enables the CPEC200 system to automatically perform zero, CO2 span, and H2O span measurements. The six-valve module (pn #26578) includes three additional valves to allow more CO2 span tanks to be measured. The valve module is housed inside the CPEC200 system enclosure. The outlet of the manifold has a proportional valve to automatically control the flow of zero/span gas. A scrub module (pn #27423) is available for the CPEC200 which provides a zero air reference source for the CPEC200 without the need for an extra cylinder which can be useful in remote applications. The CPEC200 scrub modules pulls ambient air through three bottles of molecular sieve, effectively scrubbing CO2 and water vapour from ambient air to produce the reference zero. The scrub module and its small diaphragm pump are housed within a weather-tight fiberglass enclosure which is compatible with a variety of mounting options. If the power cord is too short on the 28549 power adapter kit, can an extension cord be used? Yes. The 28549 comes with a field wireable plug (pn 28771) to make it easy to use an extension cord. Purchase an extension cord that is rated for outdoor use, and have a qualified electrician replace the female connector on the extension cord with the field wireable plug. This will avoid the issue of a power cord junction exposed to the environment.